The church organ is one of the most distinctive features of the sanctuary. This organ has over 4,000 pipes. The smallest is the size of a pencil, and the largest is 32 feet tall. It was installed in 1975 and dedicated on April 27, 1975. Below is a description of the organ was written for that service. Founded in 1879, CASAVANT FRERES LIMITEE has for many years enjoyed the reputation of building the most distinguished pipe organs in America. Incomparably fine craftsmanship and a warm, bright, clear tone are their hallmarks. The CASAVANT in Peace Memorial Church is the culmination of five years' study and careful planning and provides a magnificent vehicle for performing all the Great Literature of the Organ and of The Church. Equally at home in accompanying the worship service or in concert, the organ contains forty five stops and fifty two ranks, with preparation for twenty two additional ranks in the future Positiv and Antiphonal divisions. A movable four manual console permits great flexibility in use. It is axiomatic that an instrument be placed completely within the room in which it is to be heard, centered at one end and speaking down the long axis of the room towards the listener. The unusual perpendicular double nave of Peace Church presents nearly insurmountable acoustical and visual problems relating to pulpit, choir, and organ placement and orientation, making an approach towards ideal organ positioning all the more essential. While the instrument does favor those seated in the original nave of the church, the open placement makes a balanced hearing of the various divisions possible, regardless of the listener's seat choice. Disposition of the four divisions presently installed is readily determined visually: pipes of the Great are exposed on two chests occupying a favored and prominent central position fourteen feet above the chancel floor. The enclosed Swell and Choir Organs are mounted on three levels behind the tall center screen with the most useful accompanying voices of the Swell on the lowest level. Large basses of the Pedal may be seen at each end and at the rear of the organ niche, while Pedal upperwork is exposed on the lowest level, flanking the Swell. The future Positive is to be mounted on a single chest just above the Great, and future Antiphonal, in the rear gallery. Summary upon completion: Pipes, 4,116; Ranks, 71; Stops 65. 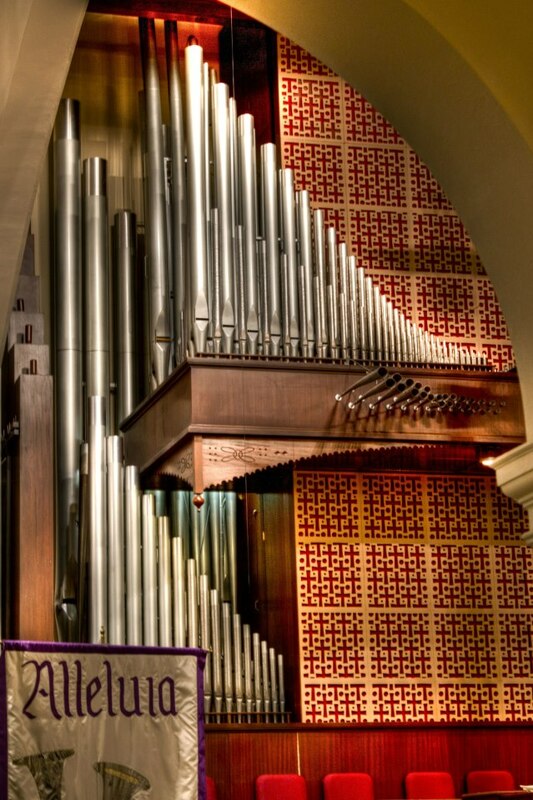 The specification was designed by Dr. Robert Hieber, Minister of Music at Peace Memorial in collaboration with John Tyrrell and other members of the CASAVANT staff The organ and its memorials were dedicated during the 11 a.m. worship service on Sunday, April 13, 1975. The pastor at the time was John A. Haley.